Geoffrey Pagen approaches clay with passion and a deep respect for the challenges inherent in his medium. His love of nature is reflected in work that retains the primal power of the California coasts and mountains where he grew up and often continues to find his inspiration. 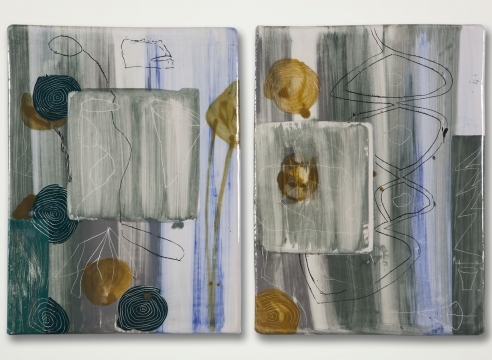 Pagen’s extensive experience with glazing and raku allows him to deftly choreograph the unpredictability of his medium. His active process combines cuneiforms, drawing, and geometric and organic forms with translucent, opaque, and iridescent glazing. The clay slabs develop into provocative single steles or modular elements of continuing and interlocking design. Pagen’s aesthetics and skill create modern interpretations of a primeval material in work that strikingly evokes the natural world that inspired it. Geoffrey Pagen received his MFA from the Rhode Island School of Design in 1975. He has received awards from both the Oregon Arts Commission and the National Endowment for the arts. He has been the Director of Ceramics at Reed College in Portland since 1979. His roster of commissions and public projects is impressive and includes Eastern Oregon State College, LaGrande; Heathman Hotel, Portland; Kaiser Permanente Hospital, Vancouver, WA; Nissho Iwai American Corp., Portland; Port of Seattle, Sea-Tac Int'l Airport, WA; Portland State University, OR; Rhode Island School of Design, Providence; Stanford Hospital, CA; and University of Oregon, Eugene.